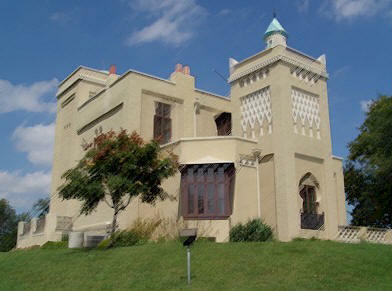 Those traveling along Illinois' Great River Road may be shocked when they reach the old town of Quincy and see what appears to be a small Moorish castle overlooking the Mississippi. The house is not a figment of their imagination but a real-life castle that was created by an eccentric millionaire named George Metz, who abandoned the place after the death of his only companion - his dog, Bingo. Although Metz loved the house, he has not returned here in death. The same cannot be said for Bingo, who continues to linger here, many decades after his passing. Villa Kathrine was built in 1900 as a virtual museum for the exotic furnishings collected by Metz during his world travels. The son of a wealthy Quincy businessman, William Metz, George was so rich that he never worked a day in life. When he came into his fortune, he decided to travel the world instead. His love for the world's wonders made Metz himself something of a wonder to the small town folks in his home town. Reporters wrote speculative tales about Villa Kathrine, which was named for his mother, and townspeople gossiped about the castle's mysterious owner. According to legend, Metz's wanderings were motivated by his lifelong dream to find the perfect home. He found it in the centuries old Villa Ben Ahben in Algiers. He later stated that he was struck by the golden color of the exterior and the large domes and became obsessed with creating his own version of the place in Quincy. He also wanted to purchase suitable furnishings for the house and he claimed to spend the next two years wandering North Africa with the "secretive Moors", haggling with caravan trains. He bought thousands of items and pieces of furniture for the villa including crescents for his domes, antique door knockers, divans, Egyptian lamps and much more. During this time, he drew and sketched and discarded ideas for the house and then he returned to Quincy to make his dreams come true. Needless to say, he had a tough time finding a sympathetic architect to build the "perfect house" in his hometown. Finally, he found a young man named George Behrensmeyer, who took Villa Kathrine on as his first commission. Together they found a site for the house on a bluff that looked down on the Mississippi River and toward the homes and buildings of the city. Working from Metz's drawings, Behrensmeyer began designs for the dream castle. He scaled the place down so that it would rest securely on the bluff and then in 1900, the brick and stucco walls of Villa Kathrine began to rise. Locals whispered about the unusual house from the very beginning. According to legend, Metz built the house in mourning over a lost love. The stories had it that he met a "fair-haired, blue-eyed" woman in Germany and together, they had discovered the beauty of Villa Ben Ahben. Metz planned to bring his love home with him to his villa on the banks of the Mississippi but his bliss was short-lived. Sadly, she refused to come to Quincy and broken-hearted, Metz retired to a reclusive life in the newly completed villa. Metz's refusal to deny or confirm the story fueled the gossip and speculation ran rampant, but little record about Metz's world travels remain except when it was related to the house. As history would have it, the villa on the hill created --- and devoured --- the man. The finished castle evoked images of Moorish homes in North Africa and Spain but at its heart, Villa Kathrine was a modest, two-story home. However, a one-story side wing, the two square towers, several porches and the numerous setbacks and projections gave it an exotic, castle-like outline. The villa's unique square south tower was decorated on all sides with a diamond pattern, with inlaid, carved lattice woodwork. Another tower was topped by a Moslem minaret with swirling red and white stripes and a silver dome. It was a miniature replica of a dome on the famous Mosque of Thais in Tunisia. The north tower also had a dome that was topped with a Muslim crescent that Metz found in an ancient ruin in northern Africa. The building was also characterized by an unusual variety of windows that included rounded and pointed arches, keyhole shapes and diamonds that added to the villa's exotic appearance. The larger windows were also fitted with grilles in Moorish patterns. A terrace surrounded the front entrance and one could reach the door through a Moorish arch. Over the front door was a tile that held a relief cast of a woman's hand that was adorned with a wedding ring and holding a dove. Some believe that it was a cast of the hand of Metz's lost love but we will never know for sure. The wooden door was ornamented with antique brass door trimmings brought from an old house in Algiers. 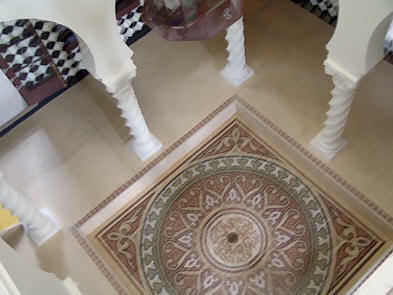 The inside of the building continued the Moorish theme. Heavy wooden beams crossed the ceiling and keyhole niches were fitted into the walls. Shelves of exotic pottery, carved chairs and tables, wall hangings and rugs added greatly to the feel of the rooms. Inside of the front door was the drawing room and up a short flight of steps and through glass doors was the interior court. The court was surrounded by a gallery that was supported by eight pointed arches embraced by spiral pillars. The pillars are copies of those in the Court of Dolls in Seville, Spain. Around the center court, on both floors, were small square rooms that bordered a central pool. Above the pool, the villa's atrium was open to the roof, where a winter glass cover would be replaced by a summer awning. The walls of the court appear to be covered in black and white tiles but this is only an illusion. For some reason, Metz had the walls painted to look like tile, an odd, money-saving gesture that stands out amidst the wealth of the house. Metz furnished the court with chairs, rugs, settees and stools and the area was dimly lit by oil lamps. In the dining room though, he hung a huge chandelier that once graced the salon of a luxurious Mississippi River showboat. The dining room and smoking room were decorated with rugs, art objects, tapestries and trophies that he had collected in the East. The stairs ascended from the court into the upper levels and the north tower. The court is surrounded by a decorative rail and around it is an upstairs gallery where the bedrooms were located. Entry to the summer dining room was gained from the north tower's stairs. Metz often dined there on summer nights, enjoying the cool air and the view of the passing boats on the river. Metz lived at Villa Kathrine as a bachelor for 12 years. He was not a total recluse though. On September 30, 1904, Albert Hastings and Pansy Darnell, an old family friend of the Metzs, were married at Villa Kathrine with Metz playing the wedding march on his pipe organ. Despite friends who often dined with him however, his only constant companion in the house was his beloved dog, Bingo. Brought over from Demark by Metz after one of his trips, Bingo was a 212-pound Great Dane that was rumored to be the largest dog in America. Metz had a special addition built for the dog off the kitchen. When Bingo died, he was buried on the grounds of the estate. Faced with the loss of his longtime friend, a cloud descended over Metz's dream, plunging him into a terrible depression. Out of fear for his safety, most based on his age and his ability to climb stairs and care for the house, Metz's relatives urged him to sell the place. Finally, in 1912, he agreed. One day, a visiting couple, who professed a great interest in the house, prevailed on him to sell to them. Their enthusiasm convinced Metz that they would be ideal occupants for the villa and he sold the house and all of its furnishings to them. Little did he know that the buyers were actually agents for the railroad, who planned to tear down the house and build a railroad yard on the site. Word got out and vandals descended on the mysterious house and carried off the decorations and the furniture, turning the place into a ruin. Metz returned to the house one time, in 1913, with a reporter from St. Louis. The house was overrun with vermin and birds, the tinted walls were stained and destroyed and what little furniture remained was shredded. He left it, vowing "never to return to this ruin again." Nineteen years later, Metz did come back for one final visit, returning this time with a reporter from Decatur to find the villa crumbling with decay. "I wish this place were mine again," he said, "I'd tear it down." George Metz never lost his love for views of the Mississippi River. After leaving Villa Kathrine, he lived in a succession of apartments with a wide view of the river, first at the Hotel Newcomb, then on the second floor of a house and finally at the Lincoln Douglas Hotel. He spent most of his spare time feeding the birds and squirrels in Quincy's parks. Poor health finally brought him to St. Vincent Hospital, where he died from pneumonia in 1937. Villa Kathrine survived the treachery of the Alton-Quincy Interurban Railroad and it passed into the lives of decades of owners, renters, caretakers and finally, the Quincy Park District. After years of decay and vandalism, the castle has at last been saved and restored for generations of people to marvel over --- and to wonder about. 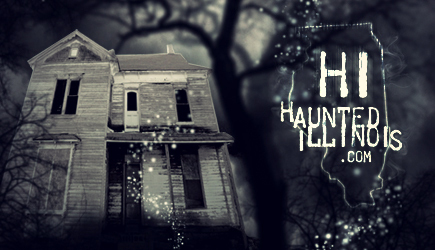 It seems impossible for such a wonderful house to exist without at least one ghost story connected to its history and it's no surprise that Villa Kathrine does have one resident ghost. As mentioned, it's the spirit of Bingo that seems to have lingered here. Perhaps it was George Metz's enduring affection for the dog that kept him from passing on to the other side, but whatever the reason, staff members at the house have often reported hearing the clicking of Bingo's toenails on the tile floors of the house. This canine phantom creates one more mystery of Villa Kathrine --- one that merely adds to the lore of the house. What drove George Metz to create such an unusual and eccentric place? We'll likely never know but we can certainly be happy that something did and gave us this little piece of weird Illinois to appreciate. Thanks to Donna Haire and the Friends of the Castle.